Smart cards or IC cards offer a huge potential for information processing purposes. The portability and processing power of IC cards allow for highly secure conditional access and reliable distributed information processing. IC cards that can perform highly sophisticated cryptographic computations are already available. Their application in the financial services and telecom industries are well known. But the potential of IC cards go well beyond that. Their applicability in mainstream Information Technology and the Networked Economy is limited mainly by our imagination; the information processing power that can be gained by using IC cards remains as yet mostly untapped and is not well understood. Here lies a vast uncovered research area which we are only beginning to assess, and which will have a great impact on the eventual success of the technology. The research challenges range from electrical engineering on the hardware side to tailor-made cryptographic applications on the software side, and their synergies. This volume comprises the proceedings of the Fourth Working Conference on Smart Card Research and Advanced Applications (CARDIS 2000), which was sponsored by the International Federation for Information Processing (IFIP) and held at the Hewlett-Packard Labs in the United Kingdom in September 2000. CARDIS conferences are unique in that they bring together researchers who are active in all aspects of design of IC cards and related devices and environments, thus stimulating synergy between different research communities from both academia and industry. 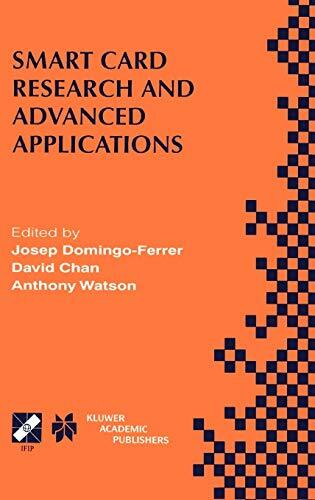 This volume presents the latest advances in smart card research and applications, and will be essential reading for smart card developers, smart card application developers, and computer science researchers involved in computer architecture, computer security, and cryptography.